With the death of the video store, it looked like there would be a similar fate for homegrown movies, but the advent of streaming video (Netflix, Hulu, etc.) and the advances in HD video photography has created a renaissance in independent filmmaking. Seemingly now more than ever, we are inundated with little movies which seemingly come out of nowhere. Simply scroll through the "New Releases" on your favorite streaming service and see how many of the titles actually mean anything to you. And yet, with all of this new technology and freedom of access, today's film hopefuls will be hard-pressed to surpass to free-wheeling days of independent filmmaking seen in the early 80s, where non-Hollywood movies went out of their way to be different. A great example is Strange Invaders. Charles Bigelow (Paul Le Mat) is a entomology professor and divorced. His ex-wife, Margaret (Diana Scarwid), drops off their daughter, Elizabeth (Lulu Sylbert), with Charles, stating that she has to return to her hometown of Centerville, Illinois, and will be back soon. When Margaret fails to come back, Charles begins to investigate Centerville, but can't get any information. So, he ventures there to find Margaret and finds a town which appears to be stuck in the 1950s, full of unhelpful people, who eventually run him off, but not before he gets a glimpse of something which looks like a monster. Returning to New York, Charles is shocked to see this same creature in a tabloid and tracks down Betty Walker (Nancy Allen), the author of the article, who claims that she found the photo in their archives. Charles and Betty begin to investigate Centerville and find themselves in the middle of a conspiracy involving the U.S. Government and aliens. Before winning an Oscar for Gods and Monsters and helming other Oscar-bait films like Dreamgirls and Kinsey, Bill Condon (here credited as William Condon) teamed with Director Michael Laughlin to make two decidedly odd films in Australia. The first was Strange Behavior (AKA Dead Kids). This film, also set in a small town in Illinois, focused on a group of teens who were turned into killers. Strange Invaders takes more of a sci-fi slant and pays as an homage to alien invasion films of the 1950s, such as Invasion of the Body Snatchers, right down to cameos by sci-fi stalwarts June Lockhart and Kenneth Tobey. I can clearly remember both films being hailed at the time for their originality. Unlike many other things, Strange Invaders has not gotten better with time. The first thing which jumps out at you about Strange Invaders is the soft focus. The film opens in the past, so we simply assume that this is a device being used to convey a flashback. But, when we get to the present, it is still there. This was favored by some directors of the period (Brian De Palma was known to use it), but Laughlin simply goes overboard with it and the degree that soft focus is used here puts any Barbara Walters Special to shame. Much of the film looks as if it was shot through gauze and (more on this in a moment), the HD transfer doesn't help. This is not only distracting, it gives the movie a decidedly dated look. Next up is the pacing. Again, Condon and Laughlin have made a modern film which includes heavy nods to 1950s sci-fi, right down to the Centerville residents who are stuck in that era. Well, they've gone to far with their homage, and instead of feeling like a movie from 1983, Strange Invaders has the tone of one of those hokey, near-melodrama sci-fi movies lampooned on Mystery Science Theater 3000. This movie simply drags at times and it becomes a challenge to remain engaged. Even the few action scenes are staged in a very pedestrian way and the movie is never suspenseful or exciting. And then we have the cast. I can remember seeing Paul Le Mat in several films back then (he was also featured in George Lucas' American Graffiti) and I don't recall him being a bad actor, but Strange Invaders proves that he's not leading man material...at least not in this kind of movie. His laconic performance does nothing to help with the lack of tension found here, and he, just like the audience, looks as if he could go to sleep at any time. Conversely, Nancy Allen is actually totally believable as a tabloid journalist, but the small spark she gives the film is too little, too late. You'll also note familiar faces like Louise Fletcher, Wallace Shawn, and Michael Lerner. Were they just looking for a free trip Down Under? I clearly remember catching Strange Invaders on HBO in the 80s, and I honestly didn't recall it being this disappointing. But, watching it today, the elements listed above slap you in the face, and you realize that the movie has not held up very well. The only part which remains interesting is the special effects makeup, which is creative and holds its own with other "transformation" movies of the era. In the end, Strange Invaders is one of those movies which has a simple, but interesting idea, but the whole thing is derailed by poor execution. 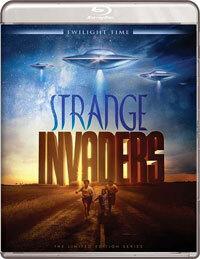 Strange Invaders blows up the station wagon on Blu-ray Disc courtesy of Twilight Time. The film has been letterboxed at 2.35:1 and the Disc contains an AVC 1080p HD transfer which runs at an average of 33 Mbps. Well, what can you say about this transfer other than soft focus? There's simply no escaping it. This creates "blooms" all over the place and obvious haloes around the actors. The image has some mild grain, which would be excusable, if it weren't enhanced by the soft picture, which clearly doesn't help the level of detail. The colors look pretty good, and the image is never too dark, but the softness ruins everything. The Disc carries a DTS-HD Master Audio 1.0 track which runs at 48 kHz and an average of 1.1 Mbps. The track provides clear dialogue and sound effects. We don't get any impressive dynamic effects here, but the dialogue, music, and sound effects are all well-balanced and one never overpowers the others. The Strange Invaders Blu-ray Disc contains only two extras. We begin with an AUDIO COMMENTARY from Director Michael Laughlin and Writer William Condon. The only other extra is the ORIGINAL THEATRICAL TRAILER for the film.